Anyone who has obsessive-compulsive disorder (OCD), or knows someone who has, will be aware of the difficulty in dealing with controlling and addictive rituals. Maybe your father is obsessed with washing his hands? Or your mother has to compulsively buy tins of food every time she goes out? Brought on by stress transforming itself into an anxiety disorder, it can take effect through actions becoming excessive in behavior and is a common mental disorder for Americans. For seniors who experience OCD, it could be signs that they’re developing dementia or Alzheimer’s Disease which can be distressing for all concerned and you may find assisted living help is required. It may start off small but these patterns of behavior combined with thoughts of anxiety and the lack of not being able to control them, can often result in troubling obsessions. For some of us, we are able to take charge of these mild forms of anxiety through relaxation, but for others, and in particular, elderly individuals, it can be a serious practice that interferes with their daily routines and relationships. This fixation often stems from a simple root problem such as an obsession over germs and dirt developing into washing hands numerous times throughout the day. Unfortunately, there is no magic cure for this type of disorder and treatments are still in early stages with some focus centered on Cognitive Behavior Therapy (CBT) having positive outcomes so far. The compulsive hoarding of items coupled with the inability to get rid of them is a typical disorder that is linked to OCD and anxiety. 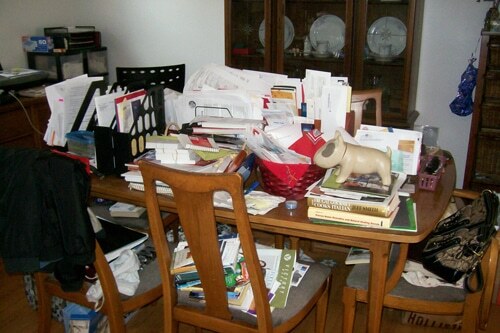 Sometimes called Diogenes syndrome to describe excessive hoarding, understanding its symptoms and risk factors can be very stressful for a caregiver to cope with. At its best, it could mean collecting coupons as an offset from food rationing; at worst, rooms can be stacked high with clutter, suggesting a person can’t let go of their possessions based on a sense of grief, loss or a fear of ‘losing’ memories. Compulsive hoarding can seriously affect the quality of life for the individual, family and friends, particularly from a health and safety aspect due to the hazard risks involved. When dealing with someone who has this type of compulsive disorder, it’s important to work through and reorganize the hoarded items slowly as not to be too distressing for the elderly person, making sure praise and reassurance are always communicated.